Family Forward Action Welcome Luann, Our New Communications Director! Welcome Luann, Our New Communications Director! Please join us in welcoming Luann Algoso as our new Communications Director! We are SO excited to have Luann on our team and we know you’ll love her, too. Next time you’re at an event or online, tell her hi! Luann is originally from Anaheim, California and moved to Portland in 2010 to finish her Bachelor of Arts in Women’s Studies at Portland State University. After completing her undergraduate degree, she went on to complete a Master of Arts degree in Conflict Resolution also at Portland State University with the thesis titled, “Comedy as a Platform for Marginalized Voices: Asian American Women and the Disoriented Comedy Showcase”. Luann is Filipina American and is constantly striving to learn more about Filipino indigenous and modern culture, language, politics, and researching ways to dismantle colonial identity. 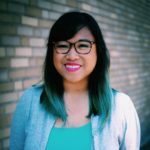 In her spare time, she likes to read and discuss feminist theory, media representations of Asians and Pacific Islanders, and the intersection of the arts and activism. She is the proud owner of a social justice corgi puppy named Atticus. If you have any questions for Luann, you can reach her at luann@familyforward.org. We are so happy that she’s joined our family.